After being closed for almost 40 years, the Omni King Edward Hotel’s Crystal Ballroom is sparkling once again. Following a $6.5 million renovation, the ballroom is set to revive the glitz and glamour of Toronto’s thriving social scene. Home to the city’s most prestigious functions from the 1920s through the 1970s, the Crystal Ballroom unveiled its new look, almost 100 years after its initial debut in 1922. Located in the heart of Toronto and within the city’s first luxury hotel, the Crystal Ballroom opened its doors to great public acclaim, standing high above the skyline on the 17th floor. The venue quickly became the most sought-after destination for high-profile galas and elegant events. 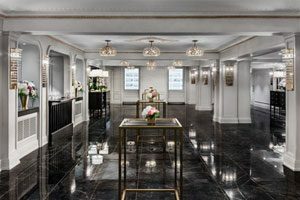 imilar to the newly renovated hotel property that underwent a $40 million transformation in 2015, the Crystal Ballroom’s restoration has been heavily influenced by its original interior featuring old-world charm, enhanced by modern style and luxury. For more, go to http://www.omnihotels.com .